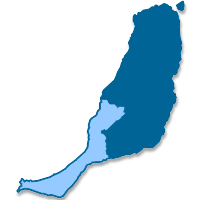 P�jara, with an area of 383,52 km², is Fuerteventura's larger municipality, encompassing the center-south zone of the island, including the peninsula of Jandía. Its average height is 196 m. above the sea level, and its seashore is 150 km long. Fuerteventura's highest point is Pico de la Zarza (807 m.), in Jandía. This peninsula is an area protected by a Natural Park. Its main neighbourhoods are Morro Jable, Costa Calma and Solana Matorral. Morro Jable, with a fishing tradition, is the venue of important international windsurf competitions. In P�jara one can visit the church of Nuestra Señora de Regla, built in 1687 and later enlarged. P�jara's economy is based on tourism, offering more than 18.000 hotel beds. The municipality has the larger beach area of all the Canary Islands. Outstanding are those of Sotavento, Cofete and Morro Jable. P�jara's coat of arms is azure, a bird or; bordure checquy of eight pieces gules, each charged with a sun or, and eight pieces argent, each charged with a pair of snakes entwined sinople. Ensigned with royal crown, closed. 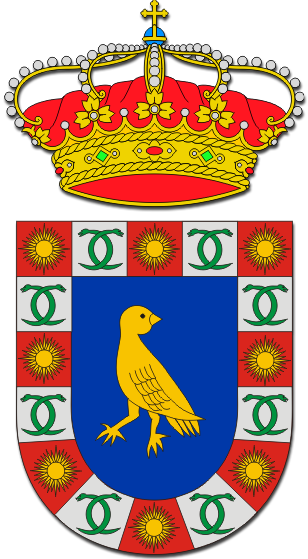 The bird alludes to the municipality's name (in Spanish, 'p�jara' means 'female bird'). The bordure shows the ornamental elements found in the façade of the church of Nuestra Señora de Regla; these elements show similarities with the Aztec art, and that is why it is supposed that they could be made or inspired by Canarian emigrants who came back from America. Order Consejería de Presidencia of 11 de noviembre de 1986 (BOC of 14 de novienbre).